Al-Jazeera journalists Peter Greste, Mohamed Fahmy and Baher Mohamed, who were convicted in Egypt of “spreading false news”, have been sentenced to three years in prison at their retrial in Cairo. Australian Peter Greste was deported back to Australia earlier this year and was on trial again in absentia. Egyptian Baher Mohamed and Canadian-Egyptian Mohamed Fahmy were led away from court after the verdict. Peter Greste, Mohamed Fahmy and Baher Mohamed are accused of aiding the banned Muslim Brotherhood group but they strenuously deny the allegations. 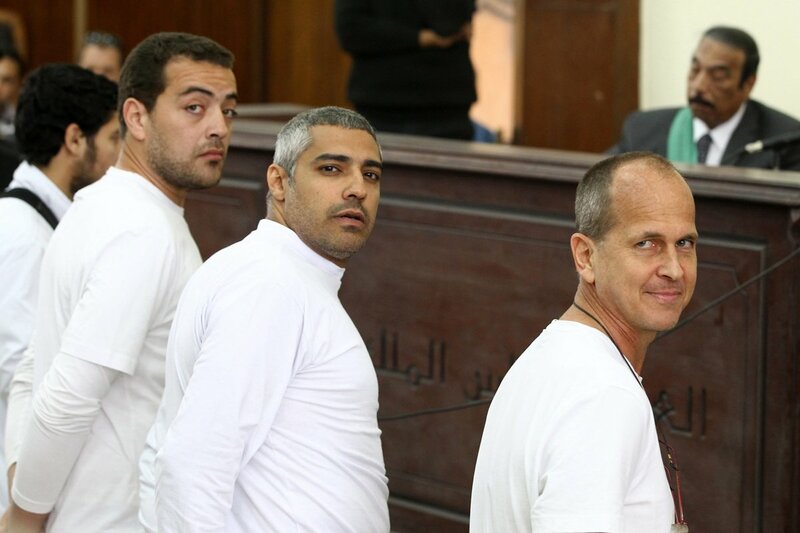 The three journalists were originally sentenced in July 2014, with Peter Greste and Mohamed Fahmy receiving 7 years and Baher Mohamed getting 10 years. However, their convictions were overturned in January 2015 and they were freed in February to await retrial. Giving the verdict on August 29, Judge Hassan Farid said the three men were not registered journalists and had been operating from a Cairo hotel without a license. The judge handed three-year sentences to Peter Greste and Mohamed Fahmy but gave Baher Mohamed an additional six months. It is unclear how long Mohamed Fahmy and Baher Mohamed will now serve. They were in prison for about a year before being freed. Lawyers for the three journalists are expected to appeal against the decision. Peter Greste said in a tweet that he was “shocked” and “outraged” while Al-Jazeera said the verdict was “yet another deliberate attack on press freedom”. Outside the courtroom, Mohamed Fahmy’s lawyer, Amal Clooney, called on Egypt’s President Abdul Fattah al-Sisi to issue a pardon to the journalists. “The verdict today sends a very dangerous message in Egypt,” she told reporters. Amal Clooney said she would push for her client, who has given up his Egyptian citizenship, to be deported to Canada.